A beautiful bathroom vanity can serve as a focal point in any bathroom, regardless of style. However, those who want to create a so-called shabby chic look in their space should choose an antique vanity and layer many different elements in as well. "Vintage décor is a heritage-inspired, layered look that consists of new and old and bringing it all together," HGTV interior designer Lisa LaPorta told FixtureForward.com. "You can have heirloom items, brand new pieces, thrift store finds, antique store treasures, you can put it all together beautifully as long as you let it reflect your personality. You can be as fun and whimsical as you want or as subdued and quiet and historical as you want." 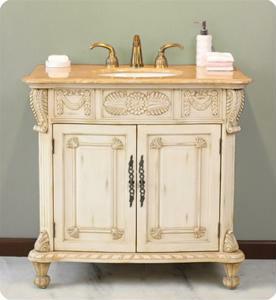 While many choose to refurbish a true antique vanity to achieve this look, there are also countless new antique-styled vanities available online and in stores. These products offer the vintage look that fans of this style want with all of the benefits of a new bathroom vanity. Trendir.com recently introduced a new line of chic bathroom vanities by Italian bathroom furniture and accessory brand Etrusca that fits this style perfectly. They feature a graceful floral relief pattern that will surely create a focal point in the space. "Choose your countertop, hardware and mirror to complete the style - chic luxury, contemporary cool or a look entirely your own," advises the website. This is very true! The types of vanities one selects should reflect from their individual personality. Very nice antique styled vanities!